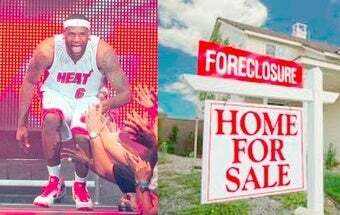 Today's newest LeBron news: he's going to fix the housing market in the Miami area because so many people want to be nearer to his effervescence, witness spectacular basketball, and jump on and off the bandwagon as close to home as possible. How do we know this? Because rich person Russell Wright, described as "a Tony Stark-esque defense contractor and country music impresario" bought a $4.2 million-dollar penthouse a scant three blocks from American Airlines Arena on the same day that LeBron announced his decision. Coincidence? Most likely. Or a guy flew down to Miami (perhaps after The Decision leaked) and bought the first condo he saw. That's just Tony Starkian enough to be plausible. Elsewhere, real estate agents at high-end brokerages saw a rise in sales during July, according to Edgardo Defortuna, head of Fortune International Realty. He goes on to say that several "friends" from "South America" have made pledges to buy up places provided Defortunata can get them Heat seats first. Kudos to Miami's real estate market for pulling themselves up by the bootstrap on the heels of a basketball player moving in and what sort of sounds like a rise in the popularity of the NBA among drug traffickers. In an unrelated note, Cleveland sold its grandmother's engagement ring to make rent last month.